You'll be £13.99 closer to your next £10.00 credit when you purchase Blood Red Snow. What's this? Günter Koschorrek wrote his illicit diary on any scraps of paper he could lay his hands on, storing them with his mother on infrequent trips home on leave. The diary went missing, and it was not until he was reunited with his daughter in America some forty years later that it came to light and became Blood Red Snow. The author's excitement at the first encounter with the enemy in the Russian Steppe is obvious. Later, the horror and confusion of fighting in the streets of Stalingrad are brought to life by his descriptions of the others in his unit – their differing manners and techniques for dealing with the squalor and death. He is also posted to Romania and Italy, assignments he remembers fondly compared to his time on the Eastern Front. This book stands as a memorial to the huge numbers on both sides who did not survive and is, some six decades later, the fulfilment of a responsibility the author feels to honour the memory of those who perished. This is a book I would require students of the Russian Campaign to read, it is one of the finest accounts of service and combat action of primary accounts I have come across. This is a superb memoir of a typical German infantryman on the Russian Front. ... He give a vivid sense of the sheer horror and hopelessness which ensues when when infantry, devoid of cover and heavy weapons, are overrun by tanks. ... Told without any trace of enmity or political ideology, this is a simply a soldiers' story, of a man who does his duty and fights for the lives of his comrades. The author gives a more balanced descriptions of his Soviet enemies than some German memoirs, largely avoiding the cliched descriptions of a mindless hordes advancing with commissars at the rear that blight other accounts. The biggest surprise of many will be the chaotic nature of the German front lines for most of the time. The author was an “ordinary” German soldier who served in the hellish environment of the Eastern Front during World War 2. His memoir relates these horrific experiences and it draws the reader in so that he feels that he too is in the frontline standing next to the author. As you read the book you feel that these men are also your friends and together you are suffering from these horrors. When the author relates how they died you too feel the loss of a friend. Such is the eloquent style of the author’s writing that anyone wishing to experience the deprivations of the Russian Front is highly recommended to read this excellent first-hand account. This memoir will always rate highly amongst those for the Russian Front and the author has done historians a great service by noting his exploits on those slips of papers that went missing for 40 years. A horrifying personal story of World War II’s most savage front. 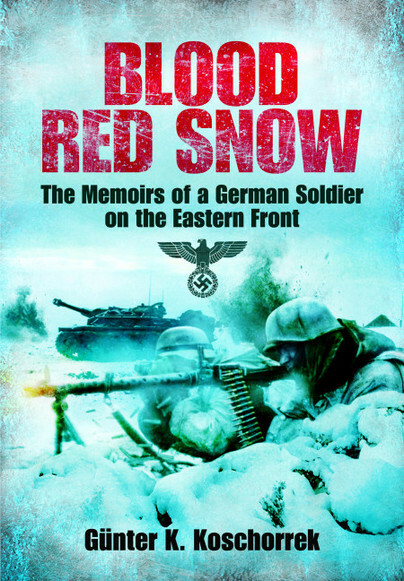 For anyone seeking to understand the experiences of the ordinary German soldier during World War II, Blood Red Snow provides an excellent starting point.